A few years ago, Ruth randomly bought some packs of Fimo clay to make some little model animals with her children. The packs sat around unopened for several months, until a friend gave her a bead-making tutorial torn from a craft magazine. The technique was for really basic beads - just simple spirals - but she was so thrilled with them that she became completely hooked. She later discovered that the technique in that tutorial was the most basic clay version of 'millefiori' which is a glass working technique used to create beautiful patterned beads since the 6th Century. A brilliant book on polymer clay millefiori by Donna Kato offered some more interesting techniques. After making a few bangles, she sold enough to her friends to try a craft fair at the end of 2014, and DoodlePippin was born. The name DoodlePippin is a combination of her mother’s pet name for her as a child (Roodlepippin), and her dog Woody - a big shaggy blonde Labradoodle. Since starting DoodlePippin Ruth has undertaken many projects using polymerclay in a variety of forms, and says she “always seems to be halfway up some sort of steep learning curve!” She was delighted to be accepted by the Surrey Guild of Craftsmen in 2016, was featured in a "Designer Profile" in Making Jewellery magazine in February 2017 and had her first tutorial for the magazine in the same month. She started teaching in 2015, and has run many courses and workshops, as well as doing demos at the bi-monthly London Polymer Clay Group meetings. Ruth is currently learning silversmithing, and has registered her hallmark, as well as working out how to print her designs onto fabric and mugs using dye sublimation. She has also had to learn how to build a website for herself, and has since created sites for many other makers and craftspeople. Ruth has completed lots of commissions (“too many to count!”), including several sets of handles for new kitchens, and a similar project for a new master bedroom. She has also made bespoke colour-matched jewellery for a wedding, many sets of bespoke tableware for weddings and anniversaries including salad servers, cake slices, and sets of forks. 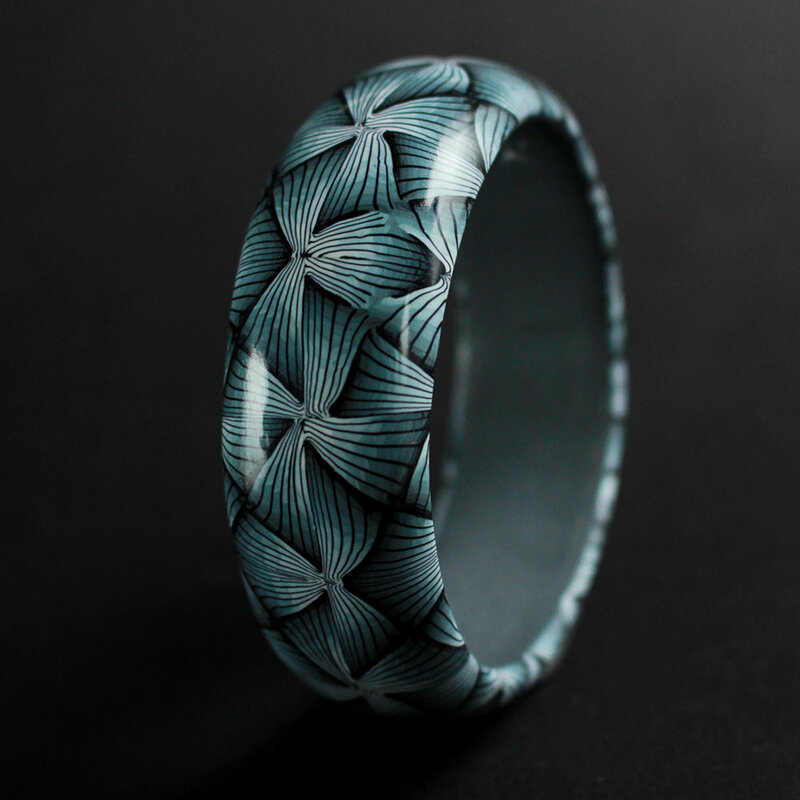 Her favourite commission are bespoke bangles combining both silver and polymer. She is now working on printing ceramic tiles, fabric and clothing using her millefiori designs. This is an occasional blog for the Surrey Guild of Craftsmen by Camilla Whybrow, Jewellery maker and Surrey Guild of Craftsmen member.